Actually what really started it all was my friend J, who told me one day as I was desperately trying to come up with a dissertation topic that she'd love to read a book about the history of classifieds. Turned out that she was interested in something totally different than what I ended up doing, but I really do owe the genesis of this project to her. However, I also owe "Bertram" a huge debt of gratitude. 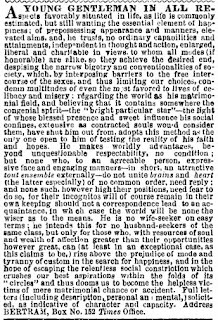 I thought doing a project about personal advertisements might be interesting, and skimming through old, nineteenth-century newspapers I did find a few, but nothing that seemed very promising. Then I ran across this guy. Not to sound cliched, but there's no way my dissertation would have gotten off the ground if it hadn't been for him. The ad is pretty long (as you see), so I'm transcribing it below. Any theater people worth their salt would recognize that the name "Bertram" is borrowed from Shakespeare's All's Well That Ends Well, but what's interesting to me is the fact that the line "bright, particular star" is actually spoken by Helena. And the story of All's Well doesn't even make a whole lot of sense in this context. Bertram actually ran away across Europe to escape Helena, whom he didn't want to marry, and the only way she was able to win him back was by pretending to be his mistress so that he would sleep with her. In any case, give poor Bertram a quick read-through. It sounds cheesy, but I'd like to dedicate this blog, maybe even my dissertation (one day book?) to him, in the hopes that he found his "bright, particular star." "and in the hope of escaping the relentless social constriction which crushes our best aspirations within the folds of its “circles” and thus dooms us to become the helpless victims of mere matrimonial chance or accident." This is so good! Is it possible that Bertram was a grad student? ?